A person is standing on a stage next to a TV with a picture of a robot on it. The robot's body is a sphere floating in midair; attached to the bottom of the sphere are a grappling hook which is not extended and a wire pointing down with a lightning bolt coming down off of it. Person: The robot floats using a helium sphere, which is highly charged and can induce lightning strikes. It moves using a grappling gun like the hook shot from Zelda. Off-panel: What is the robot for? Person: Uh. It could help with search and rescue after disasters. 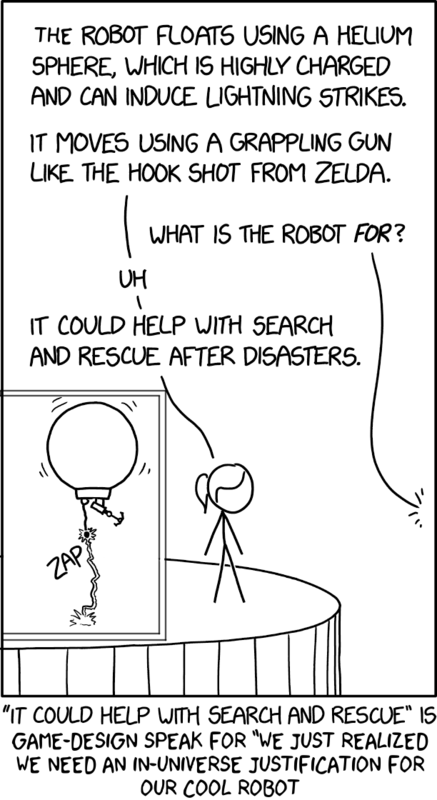 Caption: "It could help with search and rescue" is game-design speak for "We just realized we need an in-universe justification for our cool robot." Title text: Why do all of our search-and-rescue robots have fighting capabilities?